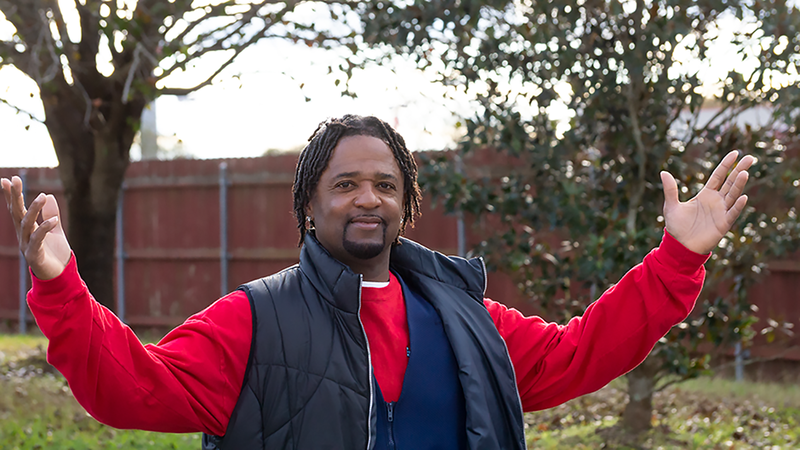 Meet Steven Washington, a resident of The Salvation Army Center of Hope shelter in Lake Charles, Louisiana. Originally from Marrero, Louisiana, Steven moved to Lake Charles at a time in his life when he had the clothes on his back and not much else. The way Steven remembers it, that was a time when addiction and some poor choices in his life had caught up with him. “Well, throughout my life I’ve lived a disobedient life to God. There’s always consequences to sin. I became homeless, alcoholic, and I came to Lake Charles to get a new start,” Steven says. “One day I just said I was sick and tired of it, I’m just going to step out on faith. I hopped out on a bus, came to Lake Charles. I had no idea where I was going to stay or what I was going to eat. I only had enough to get down here,” says Steven. His first days were rough, sleeping under an overpass and struggling with hard realities of that life. He finally found a way out when someone told him about The Salvation Army’s Center of Hope shelter. Thanks to a generous community, The Salvation Army in Lake Charles has a place for Steven to go, as well as some tools that he can use to make a new life for himself. “Year-round here in a Lake Charles we have a Center of Hope. It’s a 30-bed men’s shelter that includes a soup kitchen as well as our social service department,” says Lt. LeAnna Marion, Corps Officer of The Salvation Army of Lake Charles. While the Center of Hope can offer emergency support to those in need, they also have programs that can offer men and women like Steven a chance to set a new course in life. “Those residents who are interested can work with our housing manager to complete budget work sheets and connect them to resources in the community. They can get their IDs, TWIC cards for work, connect them to resources to help them get rides, to go to school, and to help them eventually move out,” Lt. Marion says. One of the largest industries in Louisiana is the oil and gas industry, and the TWIC (Transportation Worker Identification Credential) card is an essential tool for those who seek work offshore. Steven, an offshore worker by trade, says that he intends to make use of his new opportunity to build some better plans for the future. With the help of The Salvation Army, Steven has been able to obtain his IDs, his TWIC card, and more to help him on his way to a better life. “It’s a struggle. I’m not going to be perfect. I still struggle with past thoughts. Through my addiction to alcohol, every time an opportunity came up I just couldn’t get it right. But now my plans for the future are to get back offshore, save some money, and try to give back to The Salvation Army, to maybe help some people,” says Steven.